Book Blurb: One late fall afternoon, a tragic highway accident leaves eleven-year-old Abby and her beloved Shetland sheepdog, Tam, stranded at opposite ends of the Blue Ridge Parkway. Though each is determined to be reunited with the other, the days separating them turn to weeks, then months, and dangers and changes fill up Abby's and Tam's lives. Will they ever find their way back home to one another? Caity's review: As an animal lover and dog owner, I really enjoyed A Dog's Way Home. This heart warming novel is told from the perspective of two alternating characters-- eleven year old Abby and Tam--which I thought made this book interesting and cute. How many times do you hear the dog's point-of-view? Another great aspect of this book is that it’s so realistic. Tam sounds and acts like a real dog and Abby, despite missing her pal, has to move on with her life by doing everyday things like going to school. I liked that. I was astonished by the variety of well written characters; I liked something about every one of them. 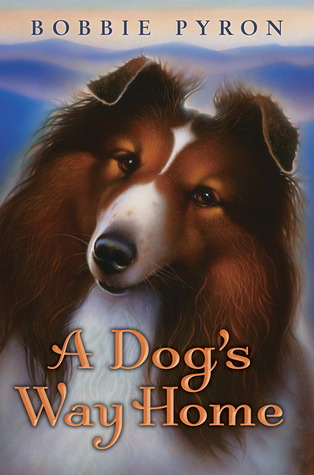 A Dog’s Way Home is a compelling page-turner with lots of adventure and drama that will touch your heart. Cover Comment: Tam’s pose is very cute. Book source: Received from author for my honest review during a book tour.